The Arkansas Archeological Survey played a major part in the commemoration of the 150th anniversary of the Civil War. As Arkansans it was important that we examine a war that changed the social, economic and political nature of Arkansas forever and shaped the state for much of the next century. 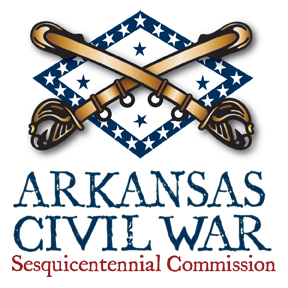 In 2007, Act 635 of the 86th Arkansas General Assembly created the Arkansas Civil War Sesquicentennial Commission (ACWSC). Dr. Jamie Brandon of the Arkansas Archeological Survey served on this commission from its founding until its dissolution in 2015, and served as the Vice-Chairman starting in 2008. The Arkansas Civil War Sesquicentennial Commission was created to promote a suitable statewide observance of the 150th anniversary of the Civil War in Arkansas. It created a website to disseminate event information and other Civil War-related content, and sanctioned a total of 732 events attended by at least 375,275 people. These events included 28 re-enactments, seven plays, 172 lectures, 59 living history events, 32 seminars, two teacher workshops, 97 marker dedications and 115 exhibits. While most people think of the Civil War as primarily the province of historians, archeologists are increasingly making important contributions to understanding this conflict―both in terms of military history and social changes wrought by the Civil War. Through the efforts of the Arkansas Archeological Survey, archeology was an important part of the commemoration. Dr. Brandon was one of the featured speakers on the AETN documentary Sesquicentennial CW 150: Remembering the Civil War in Arkansas, a one-hour program that explores why the Civil War is relevant in our modern culture and how it changed Arkansas socially, economically and politically (first aired April 25, 2011). Dr. Brandon and Dr. Carl Drexler both contributed archeology-related podcasts to the ACWSC podcast series. 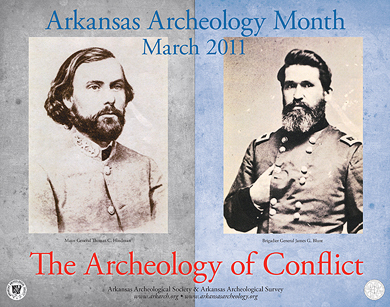 In 2011, the first year of the sesquicentennial, the Arkansas Archeology Month theme was “The Archeology of Conflict” featuring Civil War archeology around the state. Over the course of the sesquicentennial, archeological investigations were conducted at Pea Ridge, Prairie Grove, Wallace’s Ferry, Dooley’s Ferry, Cane Hill, Van Winkle’s Mill and many other Civil War era sites. These investigations will be outlined in a future edition of the “50 Moments in Survey History” series. 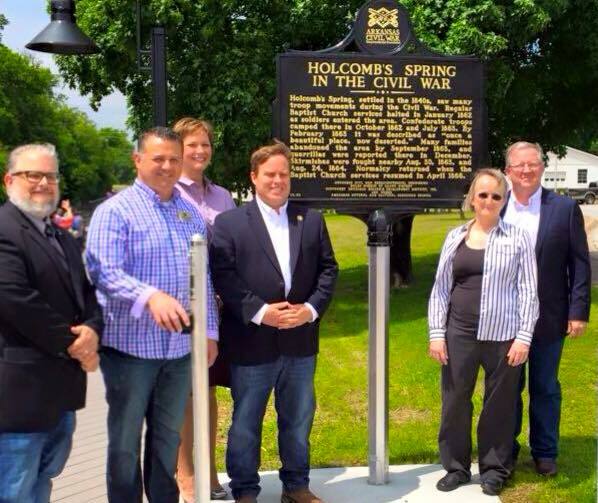 The dedication of the Holcomb Springs Marker in Springdale, AR in 2015: Dr. Jamie Brandon, Allyn Lord, Sen. Jon Woods, Rep. Jeff Williams, Rep. Jana Della Rosa, and Rep. Lance Eads. The signature preservation success during the sesquicentennial commemoration was the acquisition of the Elkin's Ferry Battlefield. Both Drs. Brandon and Drexler were involved in the effort to acquire 448 acres of land on the Little Missouri River in Nevada County where the April 4-5, 1864, action at Elkin's Ferry was fought. They helped to raise awareness of this important, undeveloped battlefield and assisted the Nevada County Depot Museum in successfully raising more than $990,000 to acquire the land. The Nevada County Depot and Museum led the acquisition effort in partnership with the ACWSC, Arkansas Historic Preservation Program, Department of Arkansas Heritage, Arkansas Natural and Cultural Resources Council, the Civil War Trust, The Conservation Fund, the American Battlefield Protection Program, National Park Service, the Prescott-Nevada County Economic Charitable Foundation, the Hendrix Foundation, the Ross Foundation, the Arkansas General Assembly and the Bank of Prescott, among others. The Civil War Trust said that this effort was one of the finest examples of local, state and national cooperation that they had seen. The purchase was completed in December 2015. Dr. Drexler is now a part of the effort to understand the battle through archeological investigations. The Arkansas Civil War Sesquicentennial Commission received a Diamond Award, the highest honor given by the Arkansas Historical Association, in 2013. Preserve Arkansas, Arkansas’s non-profit historic preservation advocacy organization, awarded the ACWSC its 2015 Award for Outstanding Achievement in Preservation Education for an Organization. The Commission also received the 2016 Arkansas Heritage Award, one of the Henry Awards given by the Arkansas Department of Parks and Tourism. The Arkansas Archeological Survey is proud to have been a part of the Arkansas Civil War Sesquicentennial efforts.